The San Marino real estate market has been nothing but miraculous during 2013. Prices have risen substantially, and there have been some landmark sales. It is so exciting to watch the improvements, but the growth is so sharp, there feels like there must be an adjustment at some point. Similar to markets across the country. San Marino CA has had a very limited inventory of available homes for sale for nearly a year. A few years ago, San Marino commonly had 40 listings available for sale, and at one point in early 2013, we were down to single digits. Even as prices began to surge, there was not a large increase in new listings. As of the end of September, 2013, the median sales price of San Marino homes rose to $1,890,000, over an 18% increase from year-end 2012. The average price per square foot on sold homes during that period rose to $710. This also is a substantial increase from a year ago. I am now beginning to see a subtle shift in the market. Inventory is inching up, most likely as a response to increasing seller expectations. As of 10/18/13, there were 17 homes on the market in San Marino. They have been on the market for an average of 48 days, and the average price per square foot on them is $876. This is aggressive pricing! I will continue to keep you updated as time progresses. 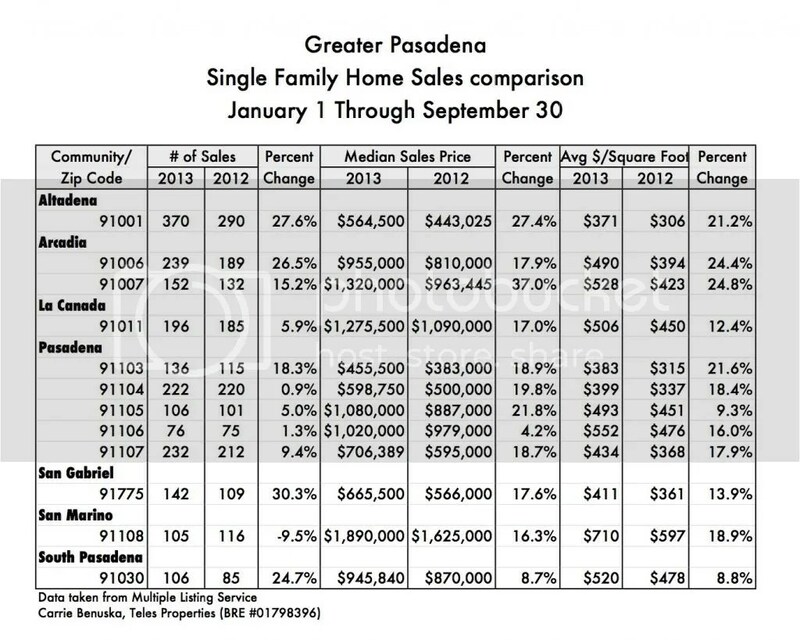 The Greater Pasadena single family sales results for the period January 1 through September 30, 2013, are extraordinary. Most communities saw double digit percentage increases in both average price per foot and median sales price from 2012 to 2013. The stand-out was the 91007 zip code of Arcadia, which saw a whopping 37% increase in median sales price from 2012 to 2013. This is something to celebrate! Sellers, it is a great time to sell. Buyers, it is time to get into the market. Greater Pasadena real estate is on a roll! Last Thursday, I had the supreme pleasure of touring a simply stunning Monterey Colonial at 719 Winston Avenue in San Marino CA. Since Winston is on my daily route, I have had the pleasure of watching this home transform. Seeing the quality and style of the exterior renovations, I knew that the interior would be wonderful, but I could not have guessed how truly splendid it would be. The whole property is perfection. The owners utilized a skilled architect who cleaned up the floor plan, created a gorgeous open family room/kitchen, and transformed the home into a modern master piece. They also engaged a gifted designer who added all of the decorative touches. Everything from the door knobs to the light fixtures to the hardware are works of art, and the overall effect is quite modern and elegant. She also used a lot of wallpaper and created amazing window treatments. The ground level has a sophisticated office, formal dining and living rooms, the fantastic open kitchen/family room, and a beautiful bath. The second floor has three bedroom suites, including a beautiful master suite with a huge bath. The bonus in the house is a fully finished basement, which provides great additional entertaining space. The rear yard is equally stunning, with a gorgeous pool, a covered patio with fireplace, and a great barbecue station. Not a detail was spared anywhere. The owners have put a hefty price tag on this property of $3,488,000, but I am confident that someone will seize the opportunity. The buyer will also have the opportunity to purchase the home fully furnished, which is a fantastic bonus, because the furniture is gorgeous. When marketing a home for sale, it is important to clarify all of the details about the home and lot, including square footage, lot size, year built, improvements made,school district, etc. This factual data is very important in establishing value. A nicely worded description will also help pitch the property, allowing the seller to spotlight key features of the home. Far more powerful than words on a page, though, photos are the key element that draw buyers to review and peruse a listing. They are the emotional hook. I am sure that most people have heard the saying, “A picture is worth a thousand words.” According to Wikipedia, this phrase “refers to the notion that a complex idea can be conveyed with just a single still image. It also aptly characterizes one of the main goals of visualization, namely making it possible to absorb large amounts of data quickly.” This phrase perfectly characterizes what photos do for a listing. They allow buyers to go beyond words and begin developing an emotional attachment with a house before ever stepping foot on the property. I am the first to admit that photos can be quite deceiving. A savvy photographer can make even the most challenging home look good. If there is an awkward space or an unpleasant room, the photographer can just ignore it. Even if buyers are disappointed when they actually tour the house in person, the photos accomplished their purpose. They presented the home in a positive light, drawing agents and buyers in for a closer look. Because photos play such an integral role in selling a home, using a professional photographer is ideal. The right equipment and a knowledge of shooting in varying lighting conditions will make a huge difference in the final product. Make sure that any home staging is done prior to shooting the photos. Photos look best when the space is tidy and extremely simple. Nothing is worse than photos with dirty dishes, unmade beds, or piles of paperwork. Be relentless about every detail in the photo so there is nothing that distracts from the overall effect. Important rooms, such as a living room, dining room, kitchen, or master bedroom deserve several photos from varying angles. When a buyer sees multiple views of one room, they can start to assemble a basic understanding of the floor plan and the flow from room to room. Make sure you end up with at least 20 high-quality and eye-pleasing images to use for print and online advertising. 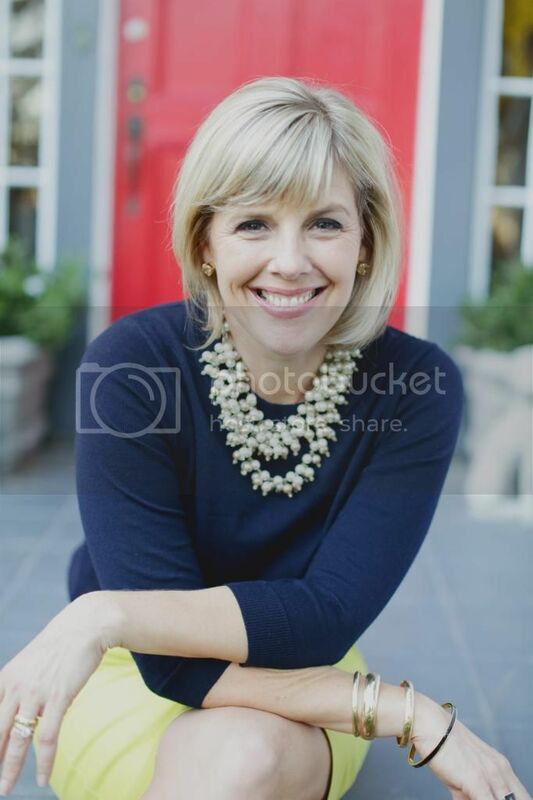 Viewers are naturally drawn to listings with more photos, so set this expectation up front with the photographer. A good shot of the front of the home is often the most important. Consider the time of day that will best capture the home without extensive shadows or glaring sunlight. A twilight photo, with all of the interior lights turned on, can be quite effective. Most full-service Realtors provide professional photographs as a part of their marketing plan, but it is a point worth clarifying at the start of the sales process. Quality photos will get any listing started off on the right foot, drawing quality buyers to your doorstep. I don’t think I am alone in my desire for a home at the beach. With a week filled with hectic work activities, annoying traffic, and blazing San Gabriel Valley temperatures, the opportunity to escape on the weekend to a relaxing coastal getaway is quite enticing. There is something about the sea breeze and the sound of crashing waves that bring me a sense of relaxation and calm. It would be ideal to have my own home-away-from-home at the beach, which would improve my lifestyle and also serve as a tremendous long-term real estate investment. My dream is to find a charming cottage within walking distance to the ocean. With all of my kids out of the nest, this home would be a place for my husband and I to retreat and refresh on the weekend. Even though a larger home that would provide room for my kids and grandkids is an ultimate dream, a small house is a great way to start! The obvious question then becomes which beach community to choose. With a variety of gorgeous beach communities within driving distance, some analysis is required to narrow the search. Pasadena residents could effectively spend each weekend anywhere from Santa Barbara down the coast to San Diego. Since a beach house is intended for relaxation, though, keeping the location centralized within Los Angeles or Orange County is ideal. Realize the above numbers do not take into consideration where the home is located within the city, and the closer you are to the beach, the more expensive the real estate. Carol Menconi of Teles Properties Newport Beach, has a wonderful beach cottage for sale on one of the “tree streets” in North Laguna Beach. 430 High Drive is move-in-ready and would serve as an ideal weekend getaway. The home has a cozy 900 square feet, but with two bedrooms and two baths, it would allow a room and bath for overnight visitors. The home has been recently renovated and features hardwood floors, a pleasing open floor plan, and an attractive white kitchen with granite counters. The kitchen is open to an informal dining area and the living room with fireplace, providing great entertaining space. The kitchen also opens to a backyard concrete patio, perfect for outdoor dining. The bedrooms are sunny, and the two baths are nicely remodeled. The highlight of the bedroom space is a scenic outdoor deck, which provides views of the grassy front yard and the ocean beyond. This perch would be my ideal spot for morning coffee and the morning paper. The home is easily accessible to the beach and the adorable shops, art galleries, and restaurants of town. Laguna is a trek from Pasadena (approximately 60 miles), but the rewards are worth it. 430 High Drive is available for sale at $1,395,000. Like most women my age, I am a faithful Facebook user. I love the ability it gives me to keep up with my friends and family members through photos and status updates. I’m one of the lucky parents who is allowed to be “friends” with my young adult kids. With two in college and one living and working in New York, their photos help me feel connected with what they are experiencing in their own lives. Checking my Facebook News Feed is an activity I look forward to each day! Pushing beyond personal usage, several years ago I learned to use Facebook as a business tool. Whenever I had a new listing, I would share photos and facts with my Facebook circle. I also learned to reach out to buyers by spotlighting interesting properties I had viewed with an honest critique. I did not have a separate business page but melded my business life together with my personal life with a fair amount of success. To help me build a deeper online presence, I hired a consultant to help me with the next steps. She signed me up for business sites like Linked In, Active Rain and Xing. She also set me up with a blog, teaching me how to upload articles and submit the posts to online blog catalogs. In addition, she helped me create a website, with interesting content and keywords that were intended to draw my site to the top of google searches. With my background in technology, I enjoyed this aspect of my business and saw it as a useful ingredient in my marketing plan. I viewed my online presence as a virtual business card, giving me credibility and reach. My early years in social media did not bring in much direct business, but I dabbled at it like a hobby. I mentioned social media at my listing presentations, but I did not use it as a point of emphasis. It felt more like a personal business development tool than a direct marketing tool that would help me better serve my clients. Over the past few months, my understanding of how social media and other online tools in the real estate sales process has been exploding. Through seminars, books, webinars, and personal discussions, my eyes are opening to the creative tools available to Realtors, sellers, and buyers alike. Innovators are pushing the envelope to make real estate accessible to online buyers, and their products are changing the real estate industry in a powerful way. Luckily, no online skills are necessary for a seller to enjoy the benefits of a social media marketing campaign. A skilled and creative Realtor can utilize online resources to market a property, and the seller can just watch the positive results roll in. In my next article, I will elaborate on a few social media tools that are being successfully utilized to aid in the real estate sales process. Although new social media sites are constantly being introduced and some take hold and are utilized in a business context (i.e. instagram, snap chat, etc. ), the ones I will discuss are the “tried and true.” I will also share about the innovations of one of the major real estate websites and how their improvements are aiding todays home sellers. The headlines are full of good news for real estate markets across the country. After years of articles on foreclosures, short sales, and financial crisis, this positive press feels like a breath of fresh air. The mounting market momentum is increasing buyer and seller confidence, but it is also creating a bit of a frenzy. Median sales price in most Greater Pasadena communities is on the rise. Interest rates continue to remain low, and well-priced homes are receiving multiple offers over the asking price. With these conditions in place, it is an amazing time to sell. Although the market could and most likely will continue to go up, all we know for certain is what is happening today. I want to sell my house, but how do I coordinate my next step so I don’t end up homeless? Today’s market is tricky, because it is easy to sell your house but not quite so easy to find your next one. Unless you can afford to carry two homes at once, creating a plan to move from one house to the next is going to require creativity, flexibility, and wise counsel. There are a few ways to do it, but each option has drawbacks and might entail incurring some amount of risk. The potential benefits are great, but a seller must feel comfortable with the process. I keep track of all the new listings on zillow.com and go to every open house, so do I really need an agent? It is true that most homes on the market make their way onto the plethora of real estate websites, but finding a house is different than actually acquiring it. The most desirable homes that come on the market sell in a matter of days, with many people fighting to be the accepted offer. Once a desirable property is identified, a skillful Realtor will help you craft a great offer and respond to any counter offers in a way that maximizes your chances of acquiring the property. Most of us would not go on an African safari without a guide, so don’t enter the wild world of home buying without someone to lead the way. I want to buy a house, but how can I compete with the many all-cash buyers? Anyone who has to get a loan is at a disadvantage to an all-cash buyer. There is a level of uncertainty involved with the loan approval process, and lenders also require an appraisal. If a seller can find someone who does not need to jump through these hoops and can also close in a quick manner, they will naturally gravitate to them. The key to competing with all-cash offers is to mimic their terms wherever possible, leaving off any contingencies possible. You should also seek to offer a price that is higher than any all-cash ones. A seller might be willing to choose your offer over an all-cash one if it is written in the right manner. Keep in mind that these are “quick answers” and only partially graze the surface of these important questions. The decision to buy or sell a home should not be made lightly, but it is easy to allow nagging questions to stand in the way of taking action. The time is right to invest in real estate, especially in the Greater Pasadena area.